We had Niagara Falls on the brain. Mark had been as a teenager but this would be a first for the rest of us. 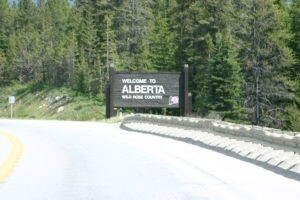 We crossed into Canada in Buffalo and drove up the Queen Elizabeth Highway to Yogi Bear’s Jellystone RV Resort. It was the closest campground to the falls and fit our needs just right. 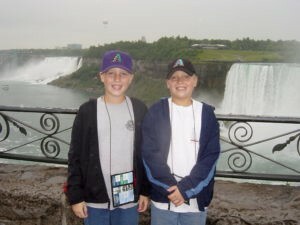 There was enough room for the boys to play a little catch, a pool to swim in, and a little miniature golf course. Blossom, our dog, loved the grass. We set up camp quickly, walked Blossom, and then hopped in the Jeep. We couldn’t wait to see the falls. 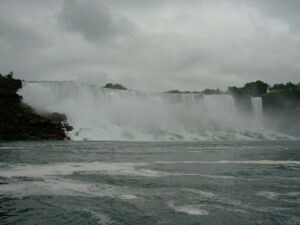 After finding a place to park, we walked over to the edge of Horseshoe Falls. It was breathtaking. And loud. We walked along the path, taking in the sights and sounds for a bit before heading back to the campground. 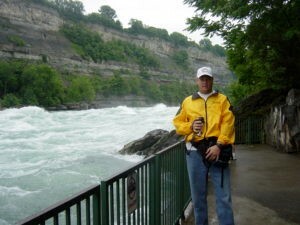 The next day was our Niagara Falls adventure. We were up bright and early and set off for our day. We’d scheduled the Journey Behind the Falls and a Maid of the Mist ride. Our tickets also got us into the Butterfly Museum, which I was the only one remotely interested in going. We had bus passes and could hop on and off all along the route near the falls. We parked the Jeep and either walked where we needed to go or hopped on the bus. It was genius on their part as it cut down on the traffic. Going behind the falls was so fun. We walked down the long tunnel toward the roar of the water before peering at the back of the waterfall at the Cataract and Great Falls Portals. 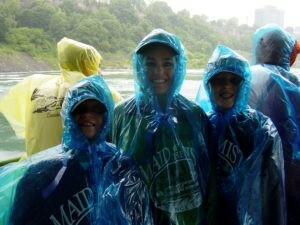 From there we were off to our Maid of the Mist ride. Wow, what an experience. Seeing it from below the crest of the falls was an awe-inspiring vantage point. It’s a great view from the top but looking up reminds you just how big the falls are. Definitely one of the best things I’ve done. From there, we went to the Whirlpool Bridge and watched the water roar by. 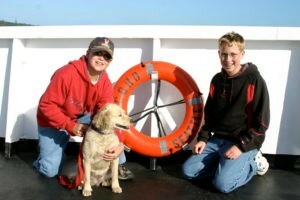 Always the adventure seeker, Mark decided it would be a fun white-water rafting trip. Yes, yes, it would be. 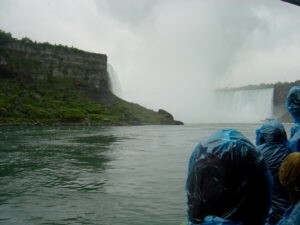 But like the song from above, we still had lots of places to go, so we left beautiful Niagara Falls via the Rainbow Bridge back into the U.S. and headed east toward Cooperstown. Our next trip to Canada was part of another three-week vacation — this time on the west coast. We played along the Oregon coast landing in Port Angeles, WA. After an early alarm, we lined up at the Black Ball Ferry Line. 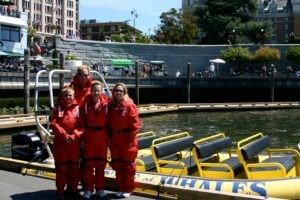 We were about to put our Winnebago and Jeep on a ferry to Victoria Island. I was not prepared for how big this ferry was as I had pictured something a lot smaller in my head. I was not expecting semis at all. It was a well-orchestrated dance of vehicles getting them all in and without any damage. I drove the Jeep on the ferry while Mark handled the motorhome. We met on the top deck for our ride to Victoria Island. When we arrived, Kevin joined me in the Jeep to take pictures while Jeff rode shotgun with Mark in the motorhome and videoed our exit. 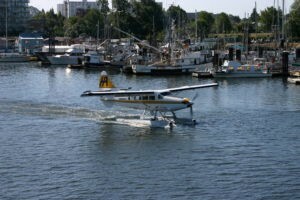 We even got to watch a seaplane land in the harbor while waiting for Mark and Jeff. That was very cool. We crammed a lot into our couple of days on Victoria Island. After we dropped the motorhome at the campground, we drove back to the harbor area and walked around. 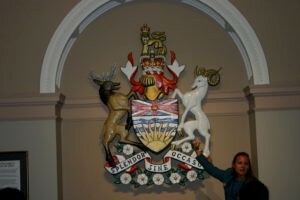 Our walking led us to the British Columbia Legislature building and we joined a tour. We’d been to Washington, DC two years prior and it was interesting to see how similar yet different Canada’s government ran. We’d already booked a whale watching tour for the next morning and after our government tour, we stopped in to confirm everything. That led us upstairs to Milestone’s Grill and Bar. It was late June; the weather was perfect and the patio beckoned us. We sat outside and had snacks, including a really good Brazilian beer, Brahma. It was good and became an obsession for us on our travels for several years. We couldn’t get it at our home in Arizona and looked at many beer menus searching for it in many states. I don’t think they make it anymore as I can’t find it anywhere. 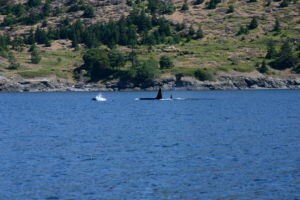 Taking a boat out to find orcas was something I’d looked forward to the entire time of trip planning. I did a report on them in second grade and still have the clay orca I made. This excursion was the sole reason for bringing the big camera. It did not disappoint and was everything I thought it would be. The only thing that would have made it better was to have one breach right next to our boat. Not only were we close enough for pictures but we could hear them exhale as they reached the surface. I took more than 100 pictures. It was so totally and completely cool! Our two days were over way too fast; we really should have stayed three more days. 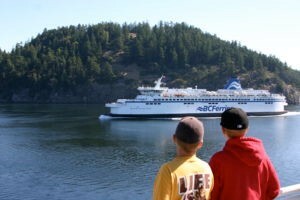 Bright and early, we left the campground for our ferry ride to Vancouver from Swartz Bay. This ride was nothing like the first one. The ride from Port Angeles to the harbor was via open water the entire way. The ride from Victoria to Vancouver took us by many small, tree-covered islands. Each island had at least one house that Mark and I remarked would be a great place to live… Always dreaming. But, we got to make an unscheduled stop! It’s become a running joke in our family that we hurry to get there, so stopping is not allowed. There are no mentions of “Hey, honey, I want to check that out!” on our trips. Never. Well, almost never. 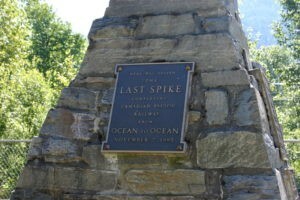 This time, we got to stop at the Golden Spike along the Canada railway. I’m sure it was because our dog Blossom needed to be walked, but we stopped just the same. 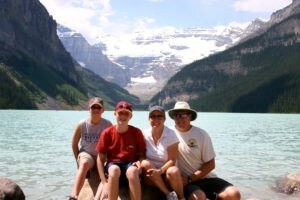 Always on a mission, we hurried through Vancouver toward Lake Louise. We got as far as Sicamous and stopped for the night. 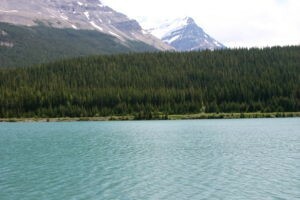 The drive was beautiful while we criss-crossed the creamy turquoise water along the Trans-Canada Highway. The next day was July 1, Canada Day. We were greeted at Lake Louise with four little Canadian flags and free camping for the night. The campground was a typical national campground, and it suited us just fine. The lady that checked us in let us know about the bear fence surrounding the campground and store and to be bear-safe at all times. For us, it was like camping at Yosemite but with a fence. We were anxious to explore our surroundings, so we hopped in the Jeep and headed to the ski resort. The views from mid-mountain looking back to the lake were breathtaking. It was as pretty as a postcard. After a snack, we rode the chair lift back down all the while looking at that beautiful lake. Back at camp, we switched out the Jeep for our bikes. Going outside the bear fence was very exciting. But we didn’t take into account the ride to the lake was all uphill along a paved trail. Boy, Jeff was not happy with us when we reached the lake! We walked around the pretty Fairmont Hotel’s grounds and treated ourselves to ice cream. After all, we did just ride up a mountain; we deserved it! The ride back was much more enjoyable for Mark and the boys. They let it fly on the downhill and zipped right out of my sight within minutes. There I am, keeping my speed under control, all alone outside the bear fence. Outside the bear fence. Uh-oh. So, I started to sing loudly in my regular screechy, out-of-tune voice. I sang “Home to You” by John Michael Montgomery over and over again all the way down the trail. Part of the trail ran near the road, but most of it was cut through the woods where bears live. 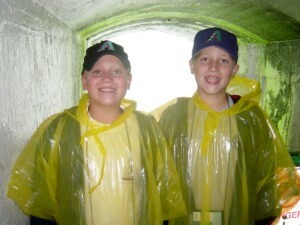 At least Mark and the boys waited for me at the gate of the bear fence. I wonder if they would have come to look for me if I hadn’t arrived! We knew about the fireworks show later that night in Banff and headed there after dinner. Growing up in Southern California, fireworks shows were around 8 p.m., but this one wasn’t scheduled to start until after 11 p.m. We walked around the cute little town before finding a spot on the ground where we listened to local bands while waiting for the fireworks. 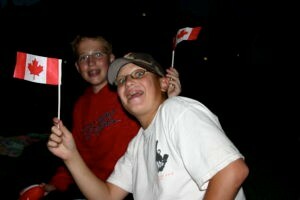 It was a fun night, and I’m so glad we lucked out to be there for Canada Day. When the fireworks were done, it was time to drive back to the campground. I distinctly remember getting off the highway at our exit facing west with just enough light to make out the outlines of the mountains. I looked at the Jeep clock and it said 12:30. It was 12:30 a.m. on July 2 and there was still some light in the sky. Amazing. The night was busy in Banff so we went back the next day for a more relaxed walk through the town. Mark and I talked about coming back again soon. 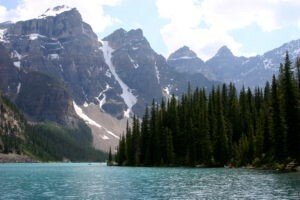 We ventured over to Moraine Lake for a hike. I could not get enough of its beauty. This picture hangs in our bathroom today. And just like that our time in Canada was coming to an end. Another early morning wake-up call for the drive south to Montana. 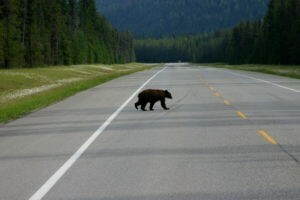 It was quiet, and the boys were still sleeping while Mark and I took in the early sights as we drove south on Highway 93. There was a river on our left, and we both saw it at the same time: A moose! We searched high and low on our Yellowstone trip, never seeing one and here we were on a desolate highway while this giant animal moved majestically in the shallow water on our left. And just like that it was over. We were going too fast to stop without spooking it, so there is no photographic proof. But, we count it as a win because we both saw it. Not much farther down the road we had more morning excitement, seeing a bear this time. He ever so casually made his way across the highway in front of us. Thankfully we had plenty of room to stop. We also were stupid and got out of the motorhome for a quick picture. We weren’t close by any means, but, afterward, we realized how dumb that was. But the pictures were pretty good. I love the zoom on my big camera. It’s time to venture north again. I’m ready to see the glaciers and some remaining daylight at 12:30 in the morning. And I still need a picture of a moose. Have you visited Canada? What were your favorite stops? Comment below. 1 Comment on O Canada! 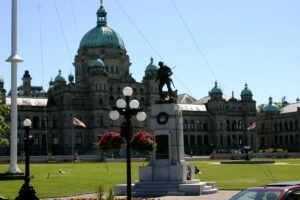 It might be helpful for your readers to know that the city of Victoria is located on Vancouver Island in BC, not Victoria Island. The government buildings there are for the province of British Columbia. If you are looking to compare something in Canada to Washingtkn DC you should visit Ottawa, the nation’s capital.